Neku's new partner for the Reapers' Game has been known to consort with cartoon ducks. 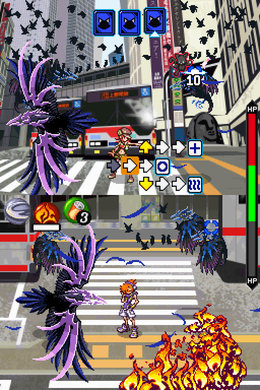 Ever since Square Enix released its cult hit The World Ends With You in 2008, fans have been clamoring for more. Despite the game's less-than-stellar sales, Square Enix has responded to their pleas. In the upcoming Kingdom Hearts 3D: Dream Drop Distance for the 3DS, series protagonist Sora will team up with TWEWY hero Neku to survive the deadly Reapers' Game. The information comes by way of a new Kingdom Hearts 3D trailer at the Tokyo Games Show. The trailer shows a lone Sora searching for his friend Riku in series mainstay Traverse Town. Sora encounters Neku instead, and the two team up. Neku's appearance marks the first time in the series that a non-original, non-Disney, non-Final Fantasy character has shown up, much less joined the party. Other information regarding Neku is scarce at this point, but expect to learn more as more Kingdom Hearts 3D coverage becomes available. The TWEWY IP had oodles of untapped potential - could Square Enix be gauging fan interest for a future game through their popular crossover series? Either way, gamers have thankfully not seen the last of Neku Sakuraba.